Graaff-Reinet is well remembered for the Valley of Desolation. The sheer cliff face is a geological phenomenon that is situated in the Karoo Nature Reserve. This 15 000 ha reserve surrounds the 200 year-old town of Graaff-Reinet. The Valley of Desolation is the product of volcanic and erosive forces of nature over 100 million years. The Valley was declared a Scenic National Monument in 1935. The columns of Dolerite rise 120 meters from the valley floor and in the distance the Karoo landscape stretches to the horizon. The endless space spreading out in various directions has rendered many tourists speechless. It is a mecca for hikers, photographers and students of flora and fauna. It is a very rewarding site after the steep drive up the mountain. A circular hiking trail of 1,5km (45 minutes) starts at the car park and leads to a wonderful view of Karoo landscape and the endless expanse of the surrounding Sneeuberg Mountains. This site is 17 km from town. Late afternoon is the best time to enjoy the scenery, since the tinted sun saturates the reds of the rock towers & the black eagles roam the Karoo skies. 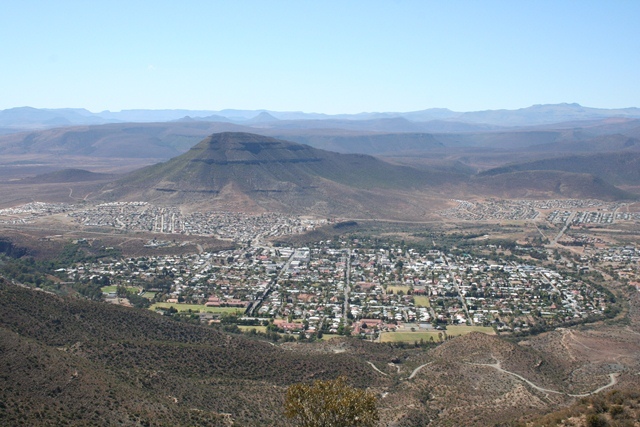 An aerial view of Graaff-Reinet taken from the toposcope on the way to the Valley of Desolation. The natural horse shoe that the Sundays River forms around the town can clearly be seen. The Sunday's river was known as the river of grass and today it still has more grass than water due to the Nqweba Dam wall. Paragliding enthusiasts from all over the world come to share the thermals of the vast Karoo skies with the resident Black Eagles and they take-off close to this area. The Dutch Reformed Church is situated in the centre of town and is one of Graaff-Reinet's many characteristics. The church is a replica of Salisbury Cathedral. The cornerstone was laid on 12 April 1886 and it then cost a staggering 7,500 pounds. Bisset had been the architect and it is said to be one of the best examples of early Gothic style architecture in South Africa. The church is to be found in the centre of town and it's the fourth church to be erected on the same spot. It was built using local sandstone. The ecclesiastical silver used by the church for many years, is exceptionally valuable and is today only viewable in pictorial form. During Reverend Andrew Murray's term of office 14 valuable items of old Cape silver were acquired for use during the communion service. The first church to be erected burnt down before completion in 1799. The second church was completed in September 1800 but it was torn down in 1822 due to ever-increasing size of the congregation. While the third church was being built open-air services were held. The third church was completed in 1823 and it had a thatched roof. The church's steeple is 150 feet and the church is lighted throughout with stained glass windows. The pulpit is an extremely handsome Gothic style structure. It has a flight of stairs on either side. The reading desk is 9 feet and 6 inches from the floor. Another interesting point is the fact that the church has a chimney. The fireplace is situated in the vestry and has never been used. The inaugural service of the Dutch Reformed Church occurred on the 11th of September 1887 and Professor de Vos delivered the sermon. 2,000 people attended the service that was held at 10:30. The church is open to visitors from 9am -4pm Mondays to Fridays. Graaff-Reinet is home to the well-known Reinet House with its famous water wheel and old vine. The Reinet House Museum is a Dutch Reformed Parsonage built in 1811. It is famous for its spacious rooms with high ceilings and yellow wood floors. Reinet House is a good example of Cape Dutch architecture and it is said to be one of the best example of H-shaped six-gabled buildings in Cape Dutch style. The famous Cape architect Louis Thibault has received claim for building the parsonage. Reinet House was one of the earliest restoration projects in Graaff-Reinet. It fell into disrepair in the early 20th century, even losing it's gables. The building had fell into disuse after the death of Reverend Andrew Murray in 1904. In 1947 The Publicity Association brought the property for R4,000. Norman Eaton was the architect that restored it into a cultural history museum. When a fire destroyed part of the museum in 1980, the contents were saved and the building restored once more. On display are dolls which were made during the First World War when luxuries such as toys could not be imported. The Reinet House Museum forms part of a museum complex of four historic buildings. The other three buildings are the Urquart House, with its peach stone kitchen floor and farm implements, the Old Library , with the Lex Bremmer Fossil Collection, the William Roe photograhic collection & Robert Sobukwe exhibition and the Old Residency with the Anglo-Boer War memorabilia. The Reinet House includes the Mill House, Wagon House & the famous Black Acorn grape vine. Rev. Charles Murray planted the vine in 1870 and it still bears fruit today. It was said to have been one of the largest vines in the world. The circumference once measures 3,1m. Reinet House also served for many years as a students' residence. A walk down Parsonage Street will lead one from Reinet House to the Drostdy Hotel. One will wander past the Old Residency which houses the Jan Felix Lategan memorial gun collection. One also passes the John Rupert Little Theatre, the Monument of the "First Republic" and the Public Library that is situated in the premise that housed William Robertson's first government school in 1824. Dr David Livingstone and his father-in-law Robert Muffat stayed at the Reinet House while the Murray Family was still living there. The Drostdy Hotel was completed in 1806 and was originally the seat of local government for 40 years. It has undergone many structural changes during its lifetime, but in 1977 was restored to its original pristine elegance and it is still in operation today. The present hotel is a little museum that cannot fail to fascinate even the most unhistorical-minded person. It offers traditional Karoo meals in a unique setting of brass candle-stick chandeliers and many tourists have commented on its wonderful ambience. It is interesting to note according to the Lantern ~ 1986 ~ that the Drostdy which was designed by Thibault was not built exactly to his specifications. It seems that the builder introduced a few variations, not unlike present day builders. In 1847 Mr Ziervogel purchased the Drostdy and its property for R 7,720. When he moved to the Transvaal in 1873 no individual could afford to buy the furnished mansion and it was turned into a hotel. The various owners made numerous alterations and by the turn of the 19th century, it was turned into a double-story building. In 1975 the Historical Homes and Oude Meester group brought the hotel and restored it to its former glory. Stretch's Court is an unique street restored in its entirety. These houses were the homes of emancipated slaves in the mid-nineteenth century. Currently, the buildings are utilized by the Drostdy Hotel for accommodation. Captain Charles Lennox Stretch came to the Graaff-Reinet colony in 1819, during the fifth Frontier War. He was appointed as government land-surveyor. In 1855 he purchased land, divided them into plots and transferred the land to coloured labourers and emancipated slaves. A century later the cottages was in despair and the Historical Homes acquired them and restored them. The Uquahart House is a fully restored house that is well-worth visiting. It houses the genealogical records for the area and it boast with a fine collection of Victorian furniture. It has a peach-stone kitchen floor and its polygram still entertains guests. This museum was once known as the Midlands Hotel. And the house is named after Mayor Uquahart that was in office from 1915 till 1931. This is the longest record for any mayor. In 1925 the Prince of Wales (later the Duke of Windsor and King Edward VIII) came to visit Graaff-Reinet. During Mayor Uquahart’s term in office Graaff-Reinet had many important visitors such as Lord & Lady Buxton (1918). Spandau Kop is another famous landmark in this region. The name is told to have originated from a German settler in the area drawing similarities between the kop guarding Graaff-Reinet in similar fashion to Spandau Prison guarding Berlin in Germany. Magistrate Andries Stockenström donated a piece of land and six windows for a Dutch Reformed missionary church. The corner stone was laid on 24 April 1821 and the church was finished later in that year. In 1965 Dr Rupert prevented the tearing down of this building. He brought the property and restored it to its former glory. Once completed it was handed over to the Graaff-Reinet town council and it's now used as an Art Museum and named in honour of Dr Rupert's mother. State president Mr C.R. Swart opened the building on 26 July 1966. This art museum boasts with over a hundred art works from leading South African artists, such as Maggie Laubser, Johannes Meintjies and Ernst de Jong. The artists donated their art pieces. The building of the town hall commenced on 30 April 1910 and was completed on 1 May 1911. This red brick Renaissance style building makes a direct contrast with the Gothic style of the fourth Dutch Reformed Church that stands immediately in front of it. The main hall measures 25,6m by 17,3m with stage facilities. It was opened by Henry Burton, the minister of native affairs, on 5 September 1911 at a grand gala evening where Handel's Hallelujah Chorus was preformed. It was built to commemorate the "great and glorious reign of Queen Victoria". Before electricity was available, the hall was lit by a gas plant capable of providing 400 lights, the installation was the largest of its type in South Africa. The John Rupert Theatre was founded when Dr Rupert purchased and restored the old Coloured Missions Church in Parsonage Street, referred to as the "Groot London". This Congregational Mission Church was responsible for the founding of the first private school for the coloured community in 1801. This was Dr Rupert's second property that he purchased, restored and handed over to the town council. The building is named after his father. The theatre was inaugurated in January 1980. And performances still occur here today. The original building was the second church that was built by the London Missionary Society in 1880. It was nicknamed the "Klein Londen". It was established to serve the needs of the South Sotho refugees who had fled to Graaff-Reinet to escape tribal battles. Since their language differed from that of the local inhabitants the London Missionary Society decided to minister to this group as a separate congregation. When the mission was closed the building deteriorated. Today this building houses the Pierneeff art collection. This restored building once housed the local library. It was opened on 4 August 1847. By 1880 the library was solely English orientated. The public library was in operation on this premises from 1847 to 1982. Today it houses the Lex Bremner fossil collection, the Rykie Pretorius costume collection and the Townley Johnson reproductions of Bushman art. Reverend William Long founded the St. James church in 1845. On Sunday, 5 October 1873, Graaff-Reinet's first pipe organ was inaugurated in the St James Church. Although it was enlarged in 1883, the instrument remained in use until 1945. The Van Ryneveld's Dam was recently renamed to the Nqeba Dam. The dam's construction had started in 1921 and had been completed in 1925. It cost in the region of £450,000. The damwall is 381m wide and 32m high. 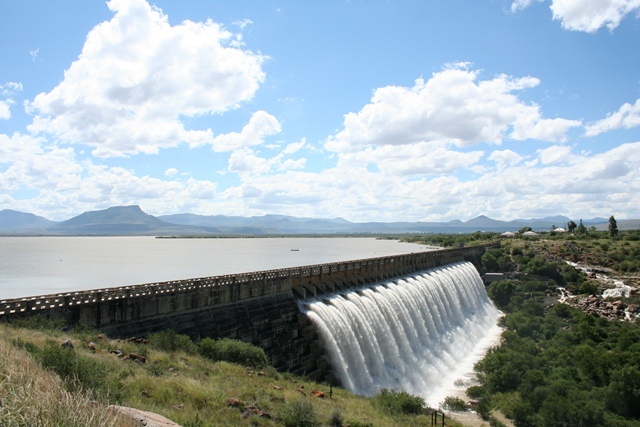 The Nqwebad Dam overflowed in 2008, the first time in nearly 20 years. The dam was bone dry in 2000. 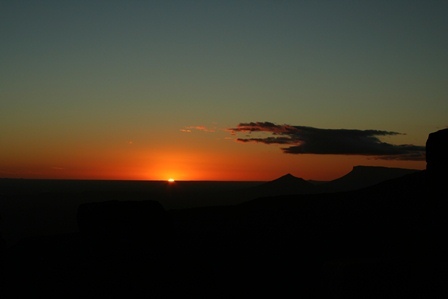 Sunset or sunrise in this region is a photographer's paradise. It is rare to see the dam this full since the average rainfall in the region is between 280 - 340mm per year. Fishing & motorised sport on the dam only allowed with permit. © 2010 Karoopark.co.za | Valid XHTML | Big Bay Designs.